The comics are created in conjunction with the app Zappar. 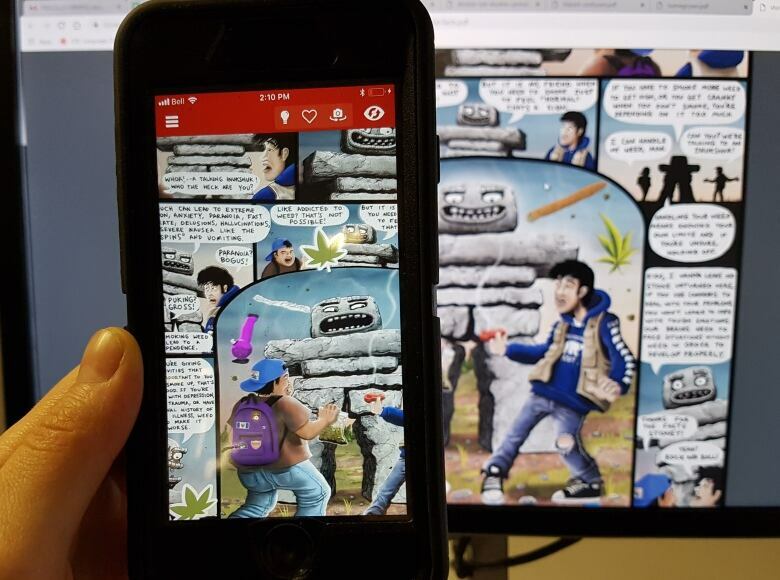 By downloading the app and pointing it at the poster, people can see and hear the comic. N.W.T. government released 4 comics, including Stoned Cold and Doobie or not Doobie? The government of the Northwest Territories is hoping Creepy Baby and Stoney the Inukshuk will help educate northern youth about cannabis. MP Michael McLeod announced that over the next three years, the federal government would be investing $1.8 million into the territory's cannabis education. It's been working on the augmented reality posters for seven months. 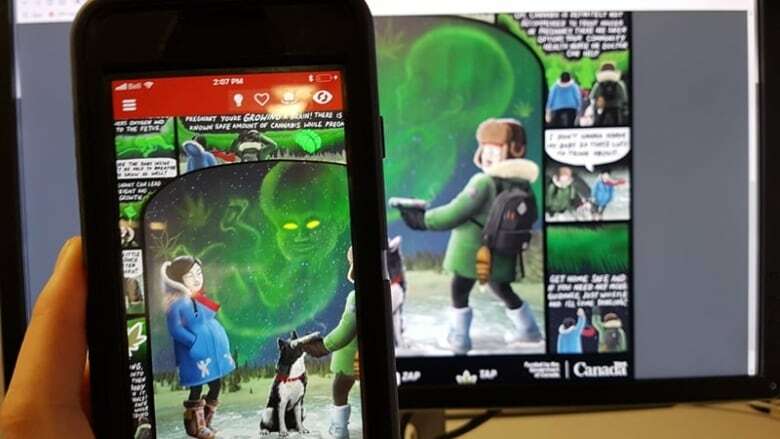 By pointing a phone or tablet at the poster while using the app, people can see an animated version of the comic on their phone. The animation comes with dialogue and one of the videos was voiced by CBC's Trail's End host Lawrence Nayally. 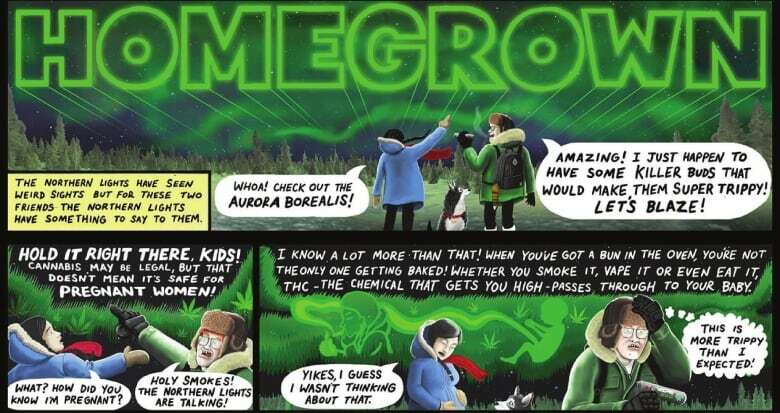 In the comic Homegrown, a man and a pregnant woman are considering smoking cannabis when the northern lights interject. "Hold it right there kids!" exclaim the northern lights. "Cannabis may be legal, but that doesn't mean it's safe for pregnant women." The northern lights continue to tell the pregnant woman that smoking cannabis while pregnant can result in passing THC to the baby. The woman questions the northern lights: "What if I get morning sickness? I hear smoking medical marijuana can cure that." But the lights tell her it's not safe and she should contact her community health nurse or doctor for help. 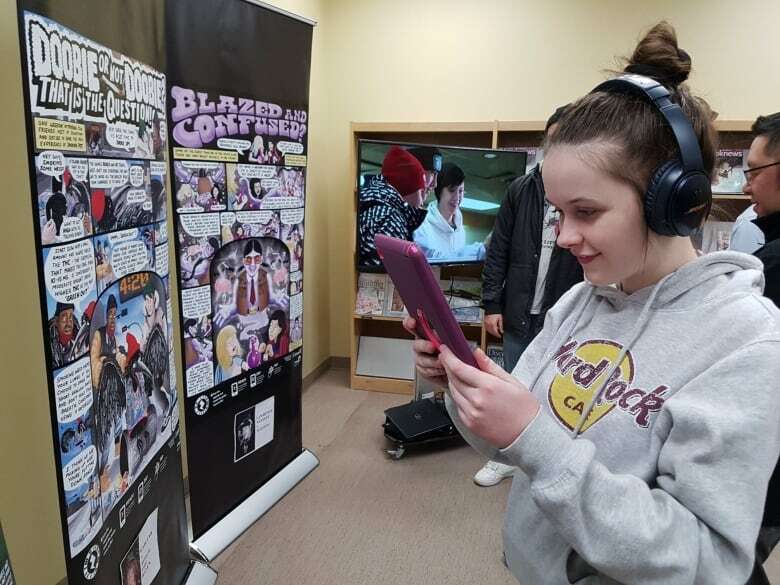 Raven Mutford, 15, was at the library during the announcement Friday. She was curious and decided to take a look at the posters. She said her favourite was Homegrown, because the aurora turns into a fetus and says, "Hi, I'm your unborn baby." "It was creepy, kind of funny, and it was really cool," said Mutford. She said the posters were a good idea because they will pique people's interest. Cody Fennell is the artist behind the comics. He said while he was working on the project, the script changed a lot. "It took a lot of digging to get stuff that everyone was confident printing." Now that the app is set up, the territorial government has the capacity to go back and add information and make changes. So it can be updated as more information is gathered. Legal cannabis rakes in close to $130K in first 4 days in the N.W.T. Some of the other topics explored in the posters include using cannabis at a young age, smoking in moderation, and smoking and driving. The next phase of the campaign will be a magazine with the comics inside. Health Minister Glen Abernethy said the posters "may not resonate with everybody." "That's why the second phase is so important," he said. The territorial government will schedule visits to all 33 communities. It will tailor its education plans for each community, which could include things like theatre productions. A previous version of this story incorrectly stated that the territorial government worked on the project for two years. In fact, it has been working on the project for seven months.